In 1978, George A. Romero revolutionized horror cinema with his trend-setting classic DAWN OF THE DEAD. 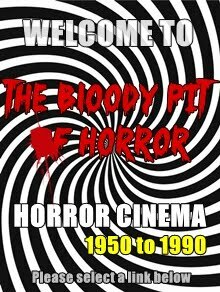 Filmed on a modest budget independently in Pennsylvania, the movie combined solid direction, sophisticated storytelling and until-then unseen levels of gore to become a huge international hit, despite the fact it played theaters with a self-applied X-rating. It also pulled off the impossible by getting positive [and most certainly deserved] critical notices across the board, even from the majority of critics reputed to have a strong distaste for the genre. So it's not surprising that many other filmmakers across the globe tried to cash-in, particularly in Europe. 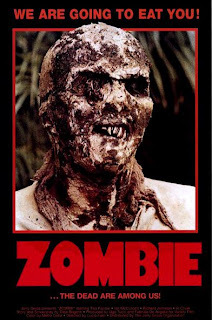 This Italian effort by Lucio Fulci was one of the first to do so and went on to become one of the most famous of all the copycats, possibly because it was released overseas as an actual sequel to Romero's film; Dawn was titled Zombi, Zombie was titled Zombi 2. 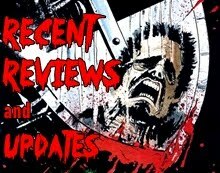 Though the films share the slow, shambling, flesh-eating resurrected dead and high levels of gore (plus snippets of the same score), the similarities pretty much end there. 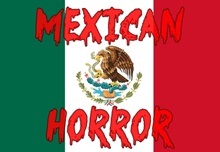 Absent are Romero's sharp satire and humor, his relatable and enjoyable characterizations, the sweeping, increasingly hopeless apocalyptic tone and the deftly-directed action and horror sequences. Fulci's film is a dirtier, grittier, more primitive affair, which drops anything substantive and gets right down to basics. The film opens as a seemingly unoccupied little boat washes into New York Harbor. 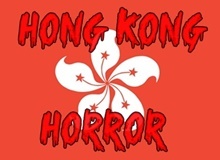 When a couple of police officers go to investigate, they're promptly attacked by a zombie, who rips one of their throats open before being shot and falling into the water. Anne (Tisa Farrow) becomes concerned because the boat came from the same desolate tropical island her scientist father (whom she's lost contact with) is doing research. She, along with reporter Peter (Ian McCulloch) decide to head to the island to investigate. They charter a boat from Brian (Al Cliver) and his girlfriend Susan (Auretta Gay) and before the four even arrive at their destination, they're already being attacked by zombies. During one of the film's most memorable scenes, while Susan's deep underwater scuba diving, she comes face to face with a flesh-eater. 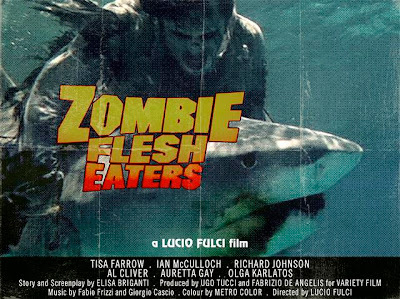 Thankfully, the attack is thwarted by a shark that rips the zombie's arm off! Our heroes finally arrive at the island and act like complete dunderheads while the living dead start popping up all over the place. We're also introduced to some more thinly-defined fodder along the way, including Richard Johnson as the mad doctor type responsible for creating the zombie plague, Olga Karlatos (who'd star in Fulci's MURDEROCK a few years later) as his hysterical wife, Stefania D'Amario (NIGHTMARE CITY) as a nurse and Dakar (ZOMBIE HOLOCAUST) as an island native. Though no match for the Romero zombie film responsible for its very existence, this isn't without its own redeeming qualities. 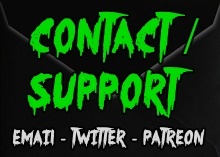 For starters, some of the zombie designs are really good, including the maggot-faced chap who winded up on the poster. The film is also filled with gore, including a now-famous bit where Karlatos gets her eyeball skewered in close-up by a jagged piece of wood. Flesh chewed out of necks, arms and legs spray blood all over the place, and there are heads being shot, a dismemberment, guts and more. The island is a nice setting for one of these things, the low-budget look of the film is also something of an accidental plus that contributes to the film's grimy atmosphere and there's an excellent score from Goblin. On the down side, the script is pretty awful; there's next to no plot, the dialogue is terrible and there are no characters to root for or care about. In fact, they all pretty much behave like morons the entire time, including standing around for minutes at a time watching zombie accumulate around them. 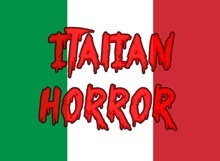 The film was co-written by the prolific Dardano Sacchetti, who had his name removed from the credits after his father passed away (he found it a little distasteful to have his name attached to a living dead flick at the time). Because of Zombie's success in theaters, Fulci would continue mining the zombie well for the rest of his career (sometimes adding supernatural slants to the stories) with such releases as THE GATES OF HELL (1980), THE BEYOND (1981) and THE HOUSE BY THE CEMETERY (1981). Just as Zombie had been re-tited Zombi 2 in Europe, other unrelated films were re-titled for home video to create a bogus "zombie" series. 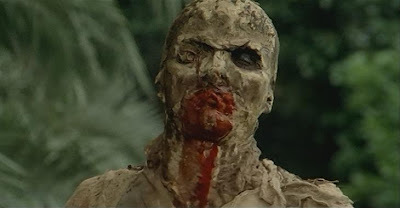 The title ZOMBIE 3 was used for a troubled production partially directed by Fulci in 1987 (Review RIGHT HERE), the sleazy BURIAL GROUND (1980) and at least three (!) other films. There are at least three different movies which have used the title ZOMBIE 4 (including THIS ONE). Jess Franco's REVENGE IN THE HOUSE OF USHER (1979 aka Nervosus) was released as ZOMBIE 5 (but so was a 1987 film originally called THE KILLING BIRDS) and Joe D'Amato's MONSTER HUNTER (a follow up to his ANTHROPOPHAGOUS aka THE GRIM REAPER) was issued on VHS as ZOMBIE 6 at one point. It's just as confusing as the "Demons" series. 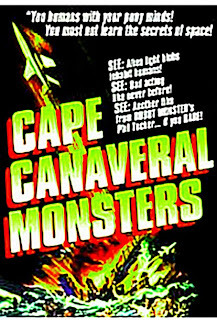 Phil Tucker, mastermind behind the notorious stinker ROBOT MONSTER (1953), strikes again! 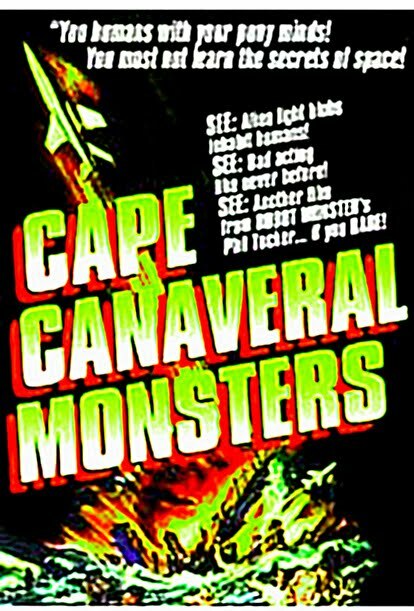 A couple leaving the beach are possessed by a pair of alien beings (represented by tiny specks of "green" light), who cause them to wreck their car and one of them to lose a limb. The aliens - Hauron (Jason Johnson) and Nadja (Katherine Victor) - hide out in a secret cave laboratory and have several chief objectives while on Earth. For starters, Hauron needs a new arm after the car wreck and a failed attempt to just sew it on (a dog ends up ripping if off), which gives them an opportunity to experiment with limb, bone and skin transplants; using unwilling victims as their guinea pigs, of course. Second, they've been given orders to sabotage NASA and prevent any rockets from leaving the planet, which means Hauron gets to frequently blast them out of the sky with his huge (looks like a rocket launcher) photon gun. And finally, the aliens are plotting to eventually invade the Earth and take over, so they'd first like to get to know and understand humans just a little bit better. They achieve this through observation, drilling captives with questions and then sticking them in their cryogenic capsule, freezing them and sending them back to their home planet for research. Meanwhile, NASA scientists can't seen to figure out why their rockets keep exploding soon after take-off. Student and brilliant young mathematician Tom Wright (Scott Peters) decides to try to get to the bottom of things. But first, he'd like to have coffee with cute co-worker Sally (Linda Connell), the daughter of one of his superiors, German scientist Dr. Heinrich Von Hoften (Billy Greene), who objects to the union and mixing business with pleasure. Nevertheless, the two lovebirds, along with their pals Bob (Gary Travis) and Shirley (Thelaine Williams) start sneaking off to Lover's Lane for some late night romance. Shirley and Bob get kidnapped and taken back to the cave, where Bob becomes an unwilling arm and chin donor to help repair Hauron and Shirley is injected with sedative, dressed in a metallic sheet, given the alien equivalent of electro convulsive shock therapy and is frozen alive in preparation for being shipped off to the alien's planet. It isn't long before Tom and Sally also find themselves being held against their will, as their colleagues and some police officers scour the beaches and hills trying to locate them. It's low-budget, some of the dialogue is silly (ditto for the 'science'), there's a really bad attempt at a foreign accent and the ending is weak (I'll get to that here in a sec), but this is still a pretty fun little diversion. I particularly liked the fact that the male alien is the slightly more compassionate of the two and wants to have pleasant conversations with humans while the female alien is colder, more evil and just wants to get down to business. The movie is also jam-packed with alien gadgets. In addition to the aforementioned photon gun and the cryogenics tube, the aliens use a device with a spinning translucent plate to communicate with their planet and a radium light to pin people to the wall. They also booby trap the cave with some kind of device that suspends people in their tracks, blast the cops with a "paralysis ray" and have a vat of bubbling goo nearby that's a portal back home. Canadian-born Scott Peters (born Peter Sikorski) had already appeared in such Z-movie classics as THE AMAZING COLOSSAL MAN (1957), INVASION OF THE SAUCER MEN (1957) and ATTACK OF THE PUPPET PEOPLE (1958) when he appeared in this one. Though he's about ten years too old for the role of a young science prodigy, he's likable and amiable enough. Plus he gets the film's best line: "I think with a little help we can lick these freaks!" Johnson and Victor are pretty amusing as the stone-faced aliens. Ms. Victor (born Katena Ktenavea) was a decent actress adept at playing villainess' and fairly well-known to cult cinema fans for her appearances in MESA OF LOST WOMEN (1952), TEENAGE ZOMBIES (1957) and a half-dozen films for Jerry Warren. In her later years, she kept steadily employed with Disney, doing continuity coordinator for such animated TV shows as Tail Spin, Darkwing Duck, Quack Pack, Aladdin, The Little Mermaid and many others. Most of the other cast members' film careers began and ended right here, though there's a long-standing (and incorrect) rumor that director Al Adamson is also in it. Now back to that ending... I suppose you might want to skip this paragraph if you don't want it spoiled. Our heroes manage to escape the cave before it explodes. The aliens on the other hand had already transformed back into light specks and returned to their planet minutes earlier. Since the alien duo had already mentioned they're planning to takeover the Earth, it felt kind of half-assed and incomplete for the leads and their rescuers to just walk off into the sunset acting carefree. Especially with the knowledge that they're going to have to face more of these alien fiends sometime in the near future. I don't mind it having an open ending per se, but I thought it would awesome if after exiting the cave our heroes looked up into the sky and it was filled with light specks. That would have been an awesome and affordable apocalyptic ending instead of just completely leaving us hanging! I might be overrating this by some people's standards, as it's usually written off as laughable schlock of par with the director's other, more-famous sci-fi turkey. I simply don't agree at all with that assessment. It's enjoyable, entertaining and with a run time of just 69 minutes, it moves at a good pace without the need for too much filler.